ā€�Ambersailā€¯ at the start of the Sydney ā€“ Hobart race. The Lithuanian yacht ā€˛Ambersailā€� finished a very respectable 13th among the 76 yachts starting in the prestigious 2012 Rolex Sydney ā€“ Hobart Yacht Race, a 1160 km course that is one of the most difficult in the world. ā€˛Ambersailā€� has made history as the first Lithuanian yacht to sail in this race. It was one of the four international entries in the race, the other 3 were from Japan and New Zealand (2 entries). After nearly 3 days of sailing, the two international entries ā€˛Ambersailā€� and the Japanese boat ā€˛KLC Bengal 7ā€� finished almost together, with ā€˛Ambersailā€� just 6 minutes ahead of ā€˛KLC Bengal 7ā€�. The two boats had been going neck and neck throughout most of the race. ā€˛Ambersailā€� had got off to a good start and maintained a leading position throughout the race, at one point moving up to 9th position. 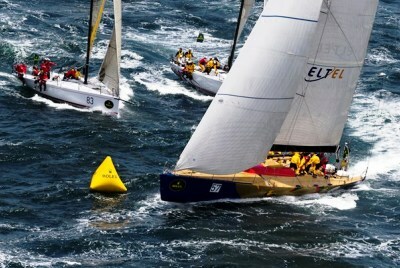 The line honours were taken out by the Australian yacht ā€�Wild Oats XIā€� with an outstanding overall result. It was declared the handicap winner as well and it also broke its own earlier record by nearly 17 minutes. ā€˛Ambersailā€�, with an all-Lithuanian crew, was skippered by experienced sailor Simonas SteponaviÄ¨ius, with helmsmen Raimondas Å iugÅ¾dinis, Saulius Pajarskas, Tauras Rymonis and navigator Raimundas Daubaras. Other ā€˛Ambersailā€� team members were ArÅ«nas BurkÅ�as, RamÅ«nas BloÅ¾Ä—, Regimantas BuoÅ¾ius, Linas Ivanauskas, Tomas Ivanauskas, Paulius JerÅ�ovas, Klaudio KliuÄ¨inskas, Gintautas MileviÄ¨ius, Rokas MileviÄ¨ius, Alvydas NaujÄ—kas, Gediminas Sirvidas, Algimantas Variakojis, Rokas VaiÄ¨iÅ«nas. The youngest crew member was Tomas Ivanauskas (21 years). On its journey to Sydney across the Pacific ā€˛Ambersailā€� had collided with a whale, which necessitated major repairs in New Zealand. But ā€˛Ambersailā€� did reach Sydney on Saturday, December 22, just four days before the start of the race on Boxing Day. The crew of ā€˛Ambersailā€� on Christmas Eve joined Sydney Lithuanians for the Lithuanian traditional Christmas Eve ā€˛KÅ«Ä¨iosā€� at the Sydney Lithuanian Club. Sydney Lithuanians wished them good sailing and success in the race.